A-Rod’s final game in pinstripes wasn’t perfect, but it didn’t need to be. In many ways, it ended up a microcosm of his complicated, unpredictable career. NEW YORK—It was a question that tore at Joe Girardi, one that had vexed him since last Sunday and was foremost on his mind through Friday afternoon. The end had come for Alex Rodriguez, and as the 22-year veteran approached the last game of his Yankees career, his manager didn’t know if he could give him the finale that he felt he deserved. 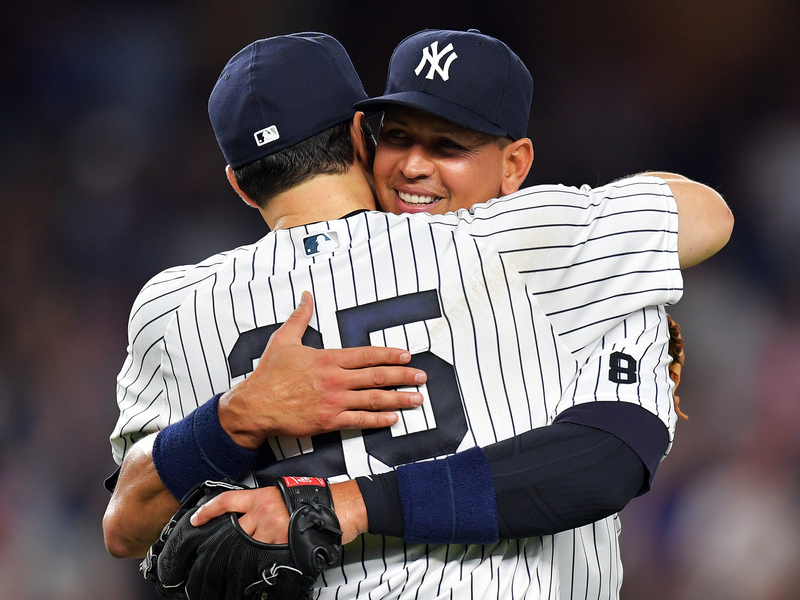 All week, Girardi and Rodriguez found themselves in a position where there seemed to be no right way to get to that promised finale, where the circumstances of Rodriguez’s bizarre departure conspired to keep him from a happy ending. In the five days between his emotional announcement that his Yankees career was over and the night that it came to an end, Rodriguez started just once, as Girardi fumbled with his attempts to find space for a player who wasn’t hitting and couldn’t field for a team that was still improbably alive in the playoff chase. On Friday, despite his stated desire to play third base one last time, Rodriguez was in the lineup as the designated hitter. But there was no guarantee of how it would all play out, just the knowledge that, one way or another, this was it for Alex Rodriguez in pinstripes, and that the road that had led there was as far from a straight line as possible. But in the final inning of Friday night’s game against the Rays, Girardi found the exit that he hoped Rodriguez would want. As closer Dellin Betances trotted out from the bullpen to protect a 6–3 lead, Rodriguez—who had gone 1 for 4 with an RBI double as the DH—ran out to the familiar third base position he had called home for nearly a decade. With the sellout crowd at Yankee Stadium screaming itself hoarse behind him, Rodriguez went to third, made some warmup tosses to first, then settled in as Betances struck out leadoff hitter Mikie Mahtook. Out came utility infielder Ronald Torreyes to replace Rodriguez—a decision he and Girardi had agreed to the inning prior—who slowly jogged back to the Yankees’ dugout. As a standing ovation roared around him, he shook hands with and hugged his teammates as he left the field for the last time. If this is the end for Alex Rodriguez—and tellingly, he deflected or avoided any and all questions before and after the game about whether this truly was the last game of his career—then it came in a fitting way: Awkward, unusual and something totally his own. It was emotional and odd, soundtracked by thunder before the game and standing ovation after standing ovation throughout. 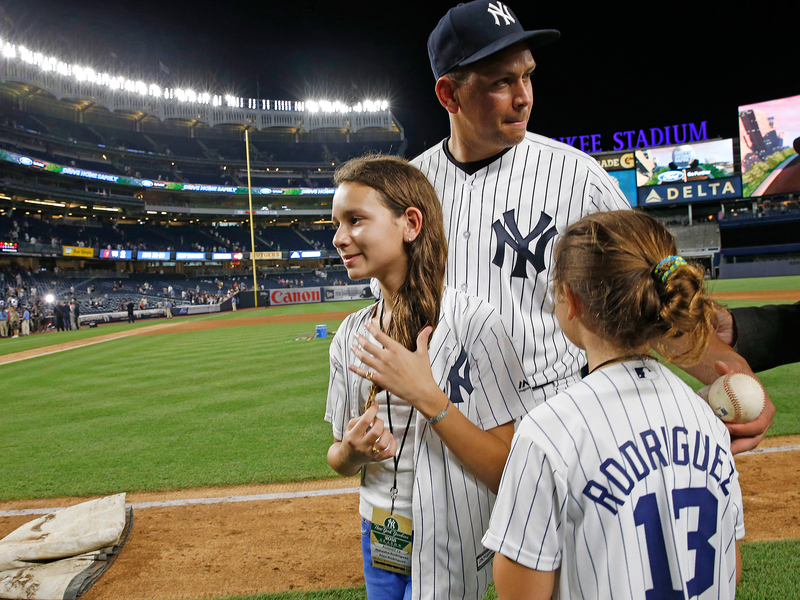 His pregame ceremony was nearly washed out, as a torrential downpour soaked him and his family as they received gifts from the Yankees under dark skies. His first at-bat resulted in a loud RBI double to the right-centerfield gap, a flash of his prodigious ability even at 41 years old; his next three ended with two weak groundouts and a strikeout, a reminder of just how much he has struggled this season. The end of Rodriguez’s 12-year tenure in the Bronx occasionally felt like a party guest being pushed out the door as he was being toasted. He got video tributes and wild cheers and pregame accolades from the usual coterie of Yankees greats—in particular, former teammates Derek Jeter and Jorge Posada and Mariano Rivera, the latter of whom was also on hand for the rain-interrupted ceremony—but there was a pervading sense that Rodriguez didn’t want to go, that he felt he still had something to offer even though the Yankees had made it clear that they didn’t believe that he did. Once the end came—after Betances recorded the final out of the game—Rodriguez came back onto the field, the recipient of yet more cheers and chants. He made his way back to third base, where he bent down and scooped up some infield dirt, then put it in his back pocket. He walked back to the dugout, where his family was waiting. He hugged his two young daughters with tears in his eyes. He tipped his cap a few more times for the fans still left in the stands. Then he descended the dugout steps and disappeared into the Yankees’ clubhouse. Perhaps that is the most fitting finale for Rodriguez, a player who defied description and expectations throughout his career, who became one of the most polarizing figures in the history of the game. It was controversial; it occasionally defied belief (“You can’t make that up,” he said of the pregame storm that interrupted his goodbye); it was uncertain and halting and tinged with weirdness. But there was no mistaking that it belonged to Alex Rodriguez. In the end, Girardi could have schemed and planned and tried to organize every last detail to make it as perfect as possible. But this fractured, messy and perhaps not even final chapter to Rodriguez’s story ended up making the most sense.